Fine Gael Cork South West TD, Jim Daly, has) welcomed confirmation from Environment Minister, Phil Hogan TD, that a social employment scheme is to be introduced by Cabinet in 2013. Responding to Deputy Daly’s calls for a framework to deal with the issue of overgrown hedges in rural areas, Minister Hogan announced that he and the Social Protection Minister, Joan Burton TD, plan to introduce a scheme next year which will allow unemployed people to participate in organised community projects, such as those designed to clean up the countryside. 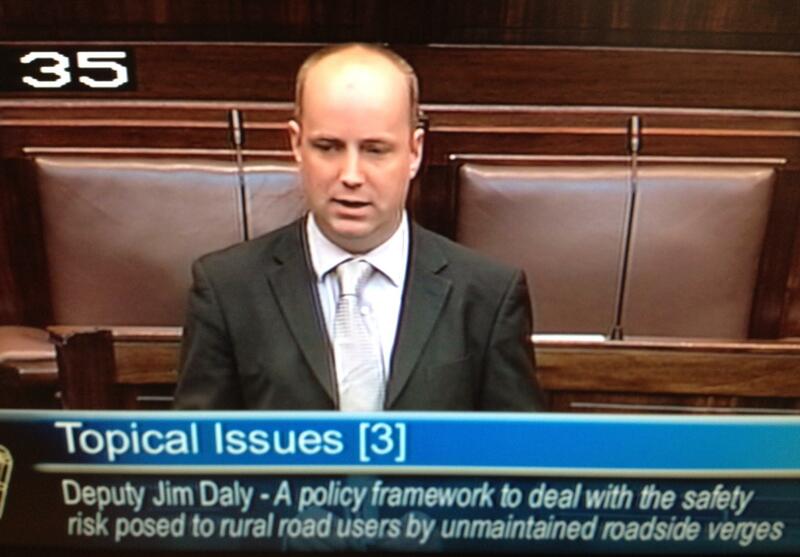 Speaking in the Dáil last night, Deputy Daly highlighted the need for the Government to be creative in ensuring the maintenance of rural roadsides, at a time of diminishing resources. “I am aware of the budgetary constraints but believe that rural people deserve more bang for their buck, especially in light of the new household charge. Well-maintained roadsides are vital for areas like west Cork, not only from a health and safety point of view but also from a tourism perspective. “Minister Hogan has confirmed to me that he is in talks with the Social Protection Minister and the Transport Minister, Leo Varadkar TD, with a view to getting unemployed people involved in community schemes, such as those that maintain local areas. It is the Minister’s hope that such a scheme will be up and running by next year.